These days it seems it’s all about convenience when it comes to appliances. You can get just about any type of appliance to link up to a smart device through a Wi-Fi app. This is true even for many models of room air conditioners at the present time. A smart window air conditioner will allow you to control it from anywhere and anyplace you can get a Wi-Fi connection. It will help you not only save money on your home cooling bill but it will also let you do such things as turn on your air conditioner before you get home so your house will be nice and cool by the time you get there. In this article, we will talk about what makes for the best smart ac. We will do this by not only giving you smart air conditioner buying information but also by doing a series of informative Wi-Fi air conditioner reviews. That way you will have all the information you need to make a sound purchase when you are shopping for a top model smart air conditioner. DIMENSIONS : 19.4 x 19.6 x 12.4"
COOLS : 350 sq. ft.
DIMENSIONS : 19.8 x 19 x 14.5"
COOLS : 450 sq. ft.
DIMENSIONS : 16 x 18.5 x 13.4"
DIMENSIONS : 21.4 x 19.8 x 14"
COOLS : 250 sq. ft.
COOLS : 550 sq. ft.
COOLS : 340 sq. 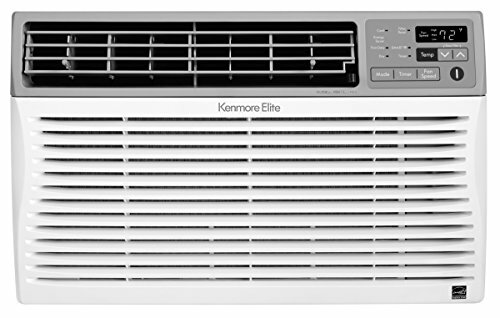 ft.
Kenmore has come up with a really clever design with this model Smart/Wi-Fi air conditioner. It can not only be controlled using a Smart device and Wi-Fi app but it can also be used in conjunction with Amazon’s popular Alexa voice app. Very few room air conditioners give you so many ways to control them. In addition to its many control methods, it has a very decent 8000 BTU’s of cooling power too. That’s enough to cool up to 350 sq. ft. in your home, garage addition or basement. This unit also has 3 different fan speeds, a remote control and will even dehumidify the air on its dry setting too. Takes 2 people to move and install because of its 58 lbs. Frigidaire has long been an innovator when it comes to cooling products so it’s no surprise they would make a window air conditioner that is Smart/Wi-Fi capable. This air conditioner model will let you use the Frigidaire app to do such things as regulate the temperature, turn it on/off and even adjust the fan speed from a remote location. Not only can it be controlled using a smart device but it has 10,000 BTU’s of cooling power too. That’s enough cooling power for an entire apartment or smaller size home (450 sq. ft.). It’s an Energy Star compliant model that will also ionize and dehumidify the air that passes through it. Here is another really nice window air conditioner from Frigidaire that can nicely be controlled using a Smart/Wi-Fi enabled device. At 8000 BTU’s it’s not quite as powerful as the first Frigidaire air conditioner on our list but it does have the option to be controlled using Amazon’s Alexa app. 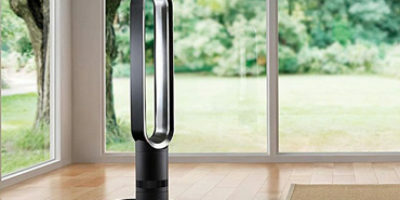 It can easily handle cooling needs for interior spaces up to 350 sq. ft. in space. This window air conditioner also has a decent EER rating (12.0). If the lights on its control panel bother you at night you can simply turn them off and it has a 1.7 pint per hour dehumidification capability too. Bulky to move and install at 54 lbs. Are you one of those people that like quality import appliances? 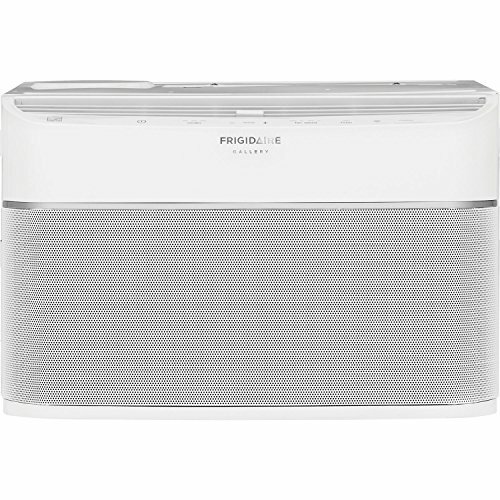 Then you will really like this Smart/Wi-Fi enabled room air conditioner from Friedrich. It is one of the more energy efficient window air conditioners you will find in our countdown too. This Friedrich 5,800 BTU air conditioner has an EER rating of just 11.2. This model room air conditioner is loaded with many features besides its Wi-Fi control capability. It has a washable antimicrobial filter, the power cord can be made to come out of either side and you can program it using 5 custom settings. It even has a design that makes it harder to break into your home than with most standard window air conditioners. Do you worry about the threat of break-in that comes with owning a window model air conditioner? 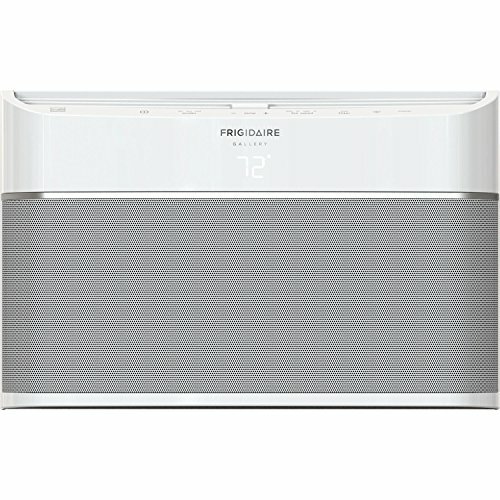 Then you will be very interested in this 12,000 BTU portable room air conditioner from Frigidaire. Not only does it cool your home (up to 550 sq. ft.) but it also does it without being mounted in a window. You just place it in the middle of any room and it will nicely cool that room and more down. What else is there to like about this stand-alone air conditioner. How about the fact you can control it from anywhere with Frigidaire’s smart app. It also features 360-degree air circulation that cools your room from the top down. It even has both 3 fan speeds and 3 cooling settings. 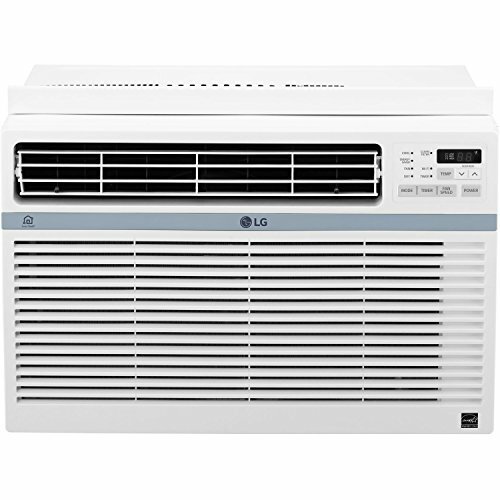 LG is a big name when it comes to inexpensive but well-built small appliances and this Wi-Fi enabled window air conditioner certainly does not disappoint. That is especially true for the budget-friendly price you will pay for it. 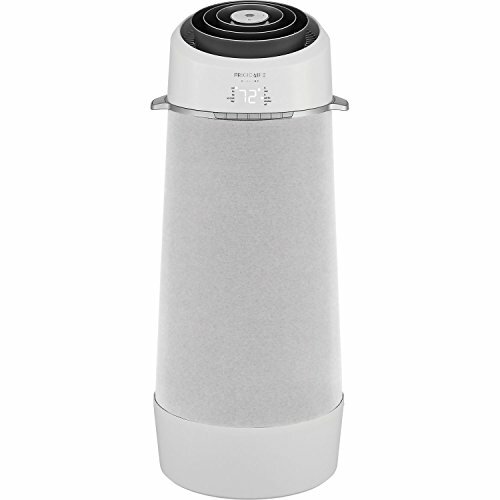 Its 8000 BTU’s of cooling power are enough to easily cool down up to 340 sq. ft. of living or office space. This LG Wi-Fi enabled air conditioner is also energy efficient. It has an EER rating of 12.1 which is very good. 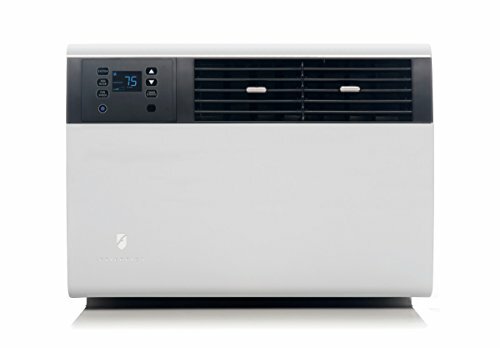 The LG LW8017ERSM Window Air Conditioner also has 4 airflow directions, an auto restart feature and several cooling and fan speed choices. Do you have an air conditioner that came with a remote control? Many people are not aware that they can also get the convenience of being able to control that same air conditioner at any time from anyplace that you can get an internet connection. It’s 100% true and all you need is a smart device and a handy air conditioner Smart/Wi-Fi controller. There are now many generic air conditioner controllers made that will turn any remote controlled air conditioner model in a convenient Smart/Wi-Fi controlled air conditioner. Here is a Wi-Fi air conditioner controller that will give you a very wide range of ways to use apps to control your air conditioner. You can even use Amazon’s Alexa voice control app to control your air conditioner. Working your air conditioner from a remote location could not be easier. Sensibo claims this app will not only work with window model air conditioners but with any type of air conditioner that is remotely controlled. It will even give you the ability to set seven-day air conditioner run time schedules. This is a great Wi-Fi enabled smart controller that will work on most remote controlled air conditioners and heat pumps. It brings you the ultimate in convenience and energy savings as far as any portable or sliding window air conditioner is concerned. The Celio Breeze works with a wide array of smart applications too. You can use it with any smart device that is iOS, Android or web compatible. It will even work with Amazon’s Alexa voice controlled app and Google Home. Other great features with this Wi-Fi enabled air conditioner control include the large easy to see LCD readout and you can program your air conditioner to run at different times on a full 7-day schedule. Here is a device that makes controlling any mini-split, window mount or portable air conditioner very easy. It also will enable you to control your air conditioner whether you are in the same room or across town at work. This Smart/Wi-Fi controller works with all IOS and Android enabled smart devices and can even be made to work with Amazon Alexa and Google Home. It’s a simple to install plug and play device to. Not only can you set up a seven-day air conditioning run schedule with it but you can monitor room temperature and humidity right on the AirPatrol WiFi/Smart Air Conditioner Controller itself. Here is a Smart/Wi-Fi enabled device that you can not only control your air conditioner with but you can control a wide variety of other household compatible devices with it too. These include such things as lighting, security cameras, thermostats, heat pumps, and home stereo systems. Now every smart device you have in your home can be controlled by one simple device and app. It works using Samsung’s SmartThings app or you can use it with Amazon’s Alexa voice control app. It will make your home a smart controlled home and make controlling all your smart devices much simpler than ever before. Not every Smart/Wi-Fi enabled air conditioner model is a good one. That’s why you have to take a close look at all of the features on the one you are thinking about buying. It’s not good enough that an air conditioner able to be used with a smart device. You have to make sure that it works with your particular smart device. Android and iOS are by far the two most popular modes for running apps on any smart device. So identify which app operating system you have on your smartphone, tablet or other smart device and then make sure it’s compatible with the model Smart/Wi-Fi enabled air conditioner that you are thinking of buying. There are other Smart/Wi-Fi enabled air conditioner characteristics that make it a preferred model also. Many of the better model Smart/Wi-Fi enabled air conditioners will also run other apps that make them even more convenient. Two of the most popular ones are Amazon’s Alexa voice control app and Google Home. Even if you find an air conditioner whose Smart/Wi-Fi ability you really like it still must be able to do the cooling task that you want it for. That means it must be able to cool the size living space that you are going to use it in. In order to size a window or portable air conditioner right, you first have to know the square foot size of the room or rooms you want to cool with it. If you have a room size that falls on the border of these square foot measurements its best to err on the side of caution and go up to the next highest BTU level. This is true for rooms that get full sun all day or seem to be in a hotter part of the house for some reason. 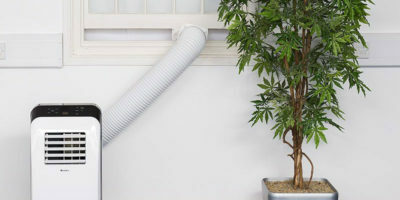 You definitely don’t want your air conditioner to be underpowered when it comes to BTU’s because it will work very inefficiently and may not even cool the living space to your liking. When shopping for smart air conditioners in a store you will notice they have a bright yellow sticker on them. On this sticker, you will see both the number of BTU’s that particular air conditioner has and the efficiency rating (EER) of that air conditioner. Smart window air conditioners come in all different efficiency ratings so try and find one that has an EER of 11 or better. That means it will be cheaper for you to run and will save you some money on your electric bill. This mainly concerns window mounted Smart/Wi-Fi enabled air conditioners. That’s because they have to be able to fit in the available space when the window is open. You can’t very well fit a 28” wide sliding window air conditioner in a 25” wide space. So it’s critical to know your window opening size before you go shopping for any window mounted Smart/Wi-Fi enabled air conditioner. It may sound like common sense but you would be surprised how many people bring home a window ac unit that does not fit. Weight is a big consideration when it comes to mounting, supporting and moving any Smart/Wi-Fi enabled air conditioner you are thinking about buying. The main reason that air conditioners are so heavy is that they have solid metal compressors inside of them. Make no mistake about it; a window or portable air conditioner that is 70 lbs. or more will be very tough to install in a window, need to be supported and will need to be carried by two or more people when taken in and out of storage. 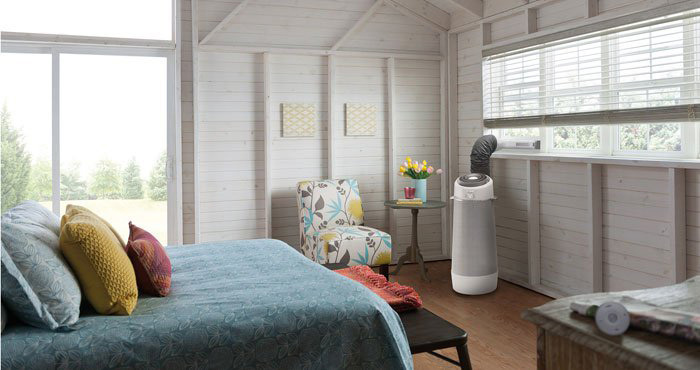 Even units that are considered ‘portable’ non-window mounted air conditioners can be very hard for a single person to move from room to room. It is also a challenge not to scratch your floors or rip a rug when moving them. So be aware of the role that weight plays in what you want to accomplish with your new Smart/Wi-Fi enabled air conditioner. The location where you want to put your new Smart/Wi-Fi enabled air conditioner should be considered too. This is kind of an extension of knowing the size and weight of your air conditioning unit. 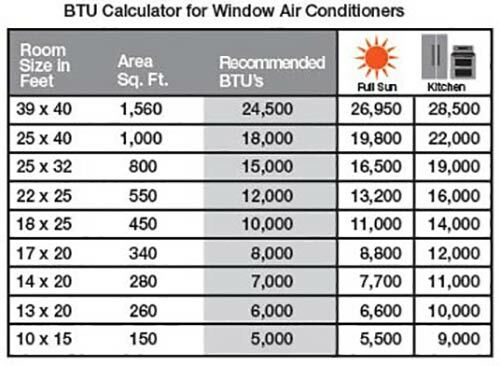 Example: if you want to cool the second floor of your home you may want to consider adding several smaller BTU window air conditioners as opposed to one large BTU unit. This is because a larger BTU unit will be heavy and bulky and hard to install in a second-floor window. It will also need a support bracket installed under it too. A smaller sliding window air conditioner will be easier to handle and won’t need additional support in most cases either. So consider where you will put your new Smart/Wi-Fi enabled air conditioner and choose wisely in relation to this. There are many filter options available with air conditioning units these days so try not to settle for one that uses a basic sponge type or mesh filter. Try to find a Smart/Wi-Fi enabled air conditioner that has a filter with air cleaning antimicrobial properties and is washable and reusable. Smart/Wi-Fi enabled air conditioners are great and really do offer a lot as far as convenience and energy savings go but it’s nice to have other control options with your air conditioning unit too. So look for easy to use push-button or mechanical controls that are built into the ac unit and having a remote control will add to the convenience of using your new Smart air conditioner too. It’s important to know the energy efficiency of any Smart/Wi-Fi enabled air conditioner you are thinking about buying. Why is that you may ask? It’s because if you have two air conditioning units you are deciding on it might be best to spend a little more money on the higher cost one if it is rated higher in energy efficiency. You will recoup the money in the long run. There is a yellow sticker on the side of every room and window-mounted air conditioner. It will contain that air conditioning unit’s energy efficiency rating (EER). As a general rule the higher the rating the less it will cost you to run an air conditioner model when comparing it to models with the same BTU rating. Don’t overlook the warranty that comes with your new Smart/Wi-Fi enabled air conditioner either. You want your air conditioner warranty to cover as much of the unit as possible and cover it for the longest possible period of time too. These are one of the cheaper options as far as cooling your home goes. They are the typical room air conditioner that gets installed by resting it on your window frame. This type of air conditioner is relatively easy to install depending on its size and there are a wide variety of options to choose from in the marketplace. The biggest drawbacks them are they are unsightly from the outside of your house and they do in most cases decrease the security of your home when in place. Window ac units are also very hard to seal up tightly. Portable air conditioners are nice because you just set them in a room and plug them in and they are ready to go. They also can be moved to different rooms when you have cooling needs in them. Bigger portable ac units can be bulky and heavy to move and with these types of air conditioners there is no fresh air option; that means you are constantly recirculating the same air in your house with them. These are by far the most expensive type of Smart/Wi-Fi enabled air conditioners but they are usually the most powerful ones too. They are a great way to cool a small apartment, room addition or detached garage office. One of the nicest things about them is that the noisy compressor unit gets installed outside of the house and only the fan part and controls are placed inside a room. The main drawbacks are, they are not good at whole home cooling and they are the hardest to install of all the Smart/Wi-Fi enabled air conditioners. We mentioned that there are many good aspects to owning a Smart/Wi-Fi enabled air conditioner. Like with any product though, there are some drawbacks that come with these types of air conditioners too. $$$ 19.8 x 19 x 14.5" 10.000 450 sq. ft.
$$ 19.4 x 19.6 x 12.4" 8.000 350 sq. ft.
$ 16 x 18.5 x 13.4" 8.000 350 sq. ft.
$$$$$ 21.4 x 19.8 x 14" 5.800 250 sq. ft.
$$$$ 12.6 x 12.6 x 36.8" 12.000 550 sq. ft.
$$ 19.4 x 19.6 x 12.4" 8.000 340 sq. ft. Question: I have an air conditioner that only has built-in mechanical controls. Can I convert it over to a Smart/Wi-Fi air conditioner? Answer: Sad to say that you cannot do this. Only air conditioning units that are remotely controlled have the necessary internal parts that give them the ability to be converted into a Smart/Wi-Fi enabled air conditioner. Question: Is there software included with a Smart/Wi-Fi enabled air conditioner to help set it up for use? Answer: Usually this is not the case, however, there will be directions included with the air conditioner unit that will direct you to where you need to go to download the app that runs your particular Smart/Wi-Fi enabled air conditioner. Question: I don’t own a smart device. Can I control my Smart/Wi-Fi enabled air conditioner using my laptop computer? Answer: Yes this is possible as long as you can download the necessary app to run your Smart/Wi-Fi enabled air conditioner and the app will work on your laptop. Having a Smart/Wi-Fi enabled air conditioner really does offer a lot to you if you own one. It means you can access and control your air conditioner from anyplace you have an internet connection. This enables to have your house cool for you when you get home without having to run your air conditioner all day to do it. You will save some good money on your home energy bill too. Now that you have read this article finding the best smart ac should be easy for you. Selecting a model that we did our Wi-Fi air conditioner reviews on is always a safe bet. If you don’t like any of those models then following the buying guide in this article will lead you to select a Smart/Wi-Fi enabled air conditioner that works for your needs and is easy to control.